1. Beat together the buttermilk, milk, egg yolks, vanilla, poppy seeds, lemon zest and juice, honey, 20g of the melted butter and ½ tsp salt in a large jug. 2. Stir the spelt flour and baking powder together in a large bowl. Make a well in the centre and roughly whisk in the buttermilk mixture. There's no need to over-beat it — small lumps are fine. Set the batter aside in a cool place for 30 minutes, or chill overnight. 3. Meanwhile, stir together the sliced citrus, dates and honey. Use immediately or cover and chill for up to 8 hours, until needed. 4. When ready to cook the pancakes, whisk the egg whites in a clean mixing bowl until stiff peaks form. Fold into the batter with a metal spoon or a spatula. 5. Put a large, heavy-based frying pan over a medium heat and lightly brush a little of the remaining melted butter over the surface. Add 4 heaped tablespoons of batter to the pan, spreading each spoonful out to form a round pancake. Cook for 2 minutes, until bubbles rise to the surface, then turn and cook for a further 1–2 minutes, until golden. Transfer the pancakes to a warm plate and cover with foil while you repeat the process to make a total of 16 pancakes. 6. 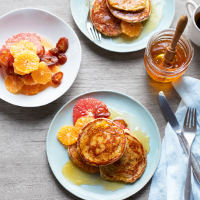 Serve a stack of 4 pancakes per person, with some of the citrus salad and a drizzle of honey.